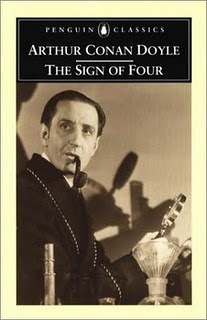 A Literary Odyssey: Sherlock Holmes: The Sign of Four. Great review! I need to try this sometime. What a fun idea, reading through a series and what a choice! Fodder for next time perhaps. Great job! I'm also gong through his works in order of publication date. I've had a bit of a break since my last read, but I think next up is Hound of the Baskervilles. I'm excited about that one. I love the characterization of Holmes! Sounds like fun, and how cool that you can already see the author improving on his style! Hey, I'm here from the Read-a-thon! This sounds like a lot of fun, I've always wanted to read the Sherlock Holmes books! Great job, keep it up! Great review. Always good to have a little mystery in your day especially on a day like today. I'm from the read-a-thon also and sooner or later I'll get to Sherlock Holmes right now I'm reading books about newer characters. Read-a-thon here! Wow, I've owned Sherlock Holmes collected works for ages, my grandfather left them to me. Maybe I should get around to reading them, lol. Have fun getting to know Sherlock and Watson better! Sounds good!! I am here from the read-a-thon site also. Good luck with the challenge! I've never read a Sherlock Holmes (hangs head)....maybe for next year's challenge! I've never thought about reading the Sherlock Holmes book, but after reading this review - I may just consider it. I love Sherlock Holmes, although I haven't read all of the SH stories. I like your idea of reading through them in order and following the progression of the characters and their background/development. I also love the premise of your blog. I am trying to read more classics as well. Oh well, back to my Readathon selection, but I'm going to have to hunt out my Sherlock Holmes collection to read soon. You know, I have never read a Holmes book, but I've been wanting too. Peter Abrahams has a series of books (Down the Rabbit Hole, Behind the Curtains, etch), featuring a young girl and amateur sleuth who loves to read Sherlock Holmes books. Glad Readathon brought me to your blog! I've always wanted to read about Holmes! I have never read a Sherlock Holmes book - I wouldn't have considered reading them in order to watch the characters develop - will have to keep that in mind. Holmes, for some reason, brings to mind winter and fireplaces - maybe I will look at him next fall! I hope everything goes well with this personal challenge of yours. Enjoy, happy reading! What an excellent idea for the thon! I really enjoyed reading your post - even though I'm guilty of it too, most people just post stats or very short reviews. Kudos to you for doing a proper post in the middle of your reading frenzy! Good luck with the rest of the challenge, and Happy Reading! Great review! I have this "the adventures and memoirs of Sherlock Holmes" book in my bookshelf, I think I really need to pick it up at some point. I'm from the read-a-thon! I bought my little brother (now not so little anymore) a complete collection of Sherlock Holmes when he was a kid, but he never ended up reading it, I don't think. Maybe I'll snaffoo it from him sometime soon to read! What a great idea, I definitely think I will have to do the same at some point, maybe next read-a-thon? Very well written review, too! Sounds like a great read and it was definatley a great review! :) Happy Reading today! 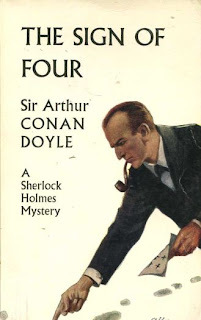 I've never read any Sherlock Holmes, but I like the idea of reading them through in order. Sounds like a fun project! I still can't believe I only read my first SH last year...what I have been missing. You have got me wanting to at least read a couple of his stories today. I really need to read more Sherlock Holmes, I think I've only read a couple of the actual stories, but love the character! Good Luck today in the read-a-thon! Wow, I love your thoughts on this! I've never read any Doyle, but I may very well have to put him on my list from what you've said about him. Good job, and keep reading! LOve Sherlock Holmes - enjoy! Fabulous review! Sherlock Holmes is definitely a baller!